Created in 2003, and newly reorganized in 2016 to operate and manage the now City-owned Tabor Opera House, the Tabor Opera House Preservation Foundation (TOHPF) is a 501(c )3 non-profit organization with the mission to preserve history by fully rehabilitating the Tabor Opera House and to serve our community by operating the building as a community event and performance space. 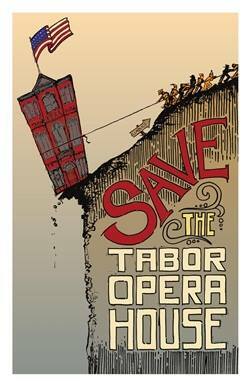 The Tabor Opera House Preservation Foundation has begun planning for restoring and preserving the historic property. We exist to restore, rehabilitate, preserve and operate the historic Tabor Opera House for the benefit and enjoyment of the public. The Tabor Opera House contributes to the Leadville National Historic Landmark District and is designated a National Treasure by the National Trust for Historic Preservation. In 2016, Colorado Preservation Inc named it an "Endangered Place." Decades of deferred maintenance and neglect have left our Tabor Opera House, a National Trust for Historic Preservation-designated National Treasure, in a perilous state. We need to work together to help SAVE THE TABOR.